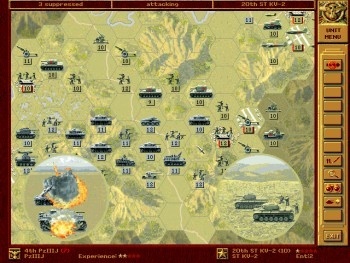 A new simulator based on the strategy classic Panzer General is proving interesting enough to the Spanish Ministry of Defense that it may end up being used to help plan real-life military strategies. Gamers of a certain age and/or bent will no doubt fondly recall Panzer General, a 1994 release from SSI that, for a brief moment at least, brought turn-based strategy to the masses. It spawned several sequels, none of which lived up to the original, and the whole thing had pretty much died out by 2000. Except, that is, in the minds of researchers at the University of Granada in Spain. The researchers decided to use the game in conjunction with an "ant colony optimization" algorithm to develop a system that could help with pathfinding problems in real combat situations. The algorithm is a probabilistic system that determines ideal paths between locations using principles similar to those employed by ants, which use pheromones to determine the best routes between their colonies and food supplies. "The result," as Game Culture notes, "is that though each individual ant is fairly stupid, the colony itself is rather smart, finding optimal routes through the collective intelligence of the group." That algorithm was incorporated into Panzer General, with troop formations taking the place of ants. "Digital pheromones" left behind by the units reinforced successful paths, while high-casualty routes eventually died off and were ignored. The research was interesting enough to attract the attention of the Spanish military, which is considering its use in devising real-life strategies; the university team claims that the modified Panzer General can also be tweaked to assist with other, more positive problem-solving, like the distribution of food aid.